1 of 2 In a small saucepan, combine raspberries, blackberries, blueberries, orange juice and sugar. Bring to a boil over high heat, then reduce heat to medium-high and simmer for 10 minutes. 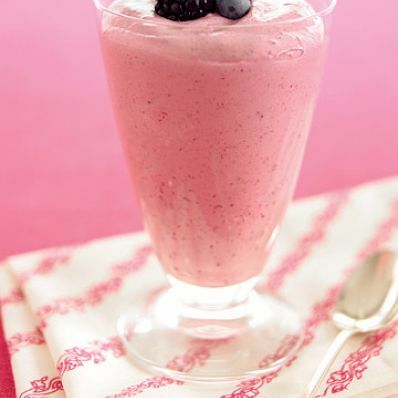 Carefully add fruit mixture to food processor and puree until smooth. Strain through a fine mesh strainer and place in the freezer for about 50 minutes, or until very cold. 2 of 2 Place thawed whipped topping in a medium-size bowl; fold in yogurt and cooled fruit puree until just combined. Serve immediately. Garnish with berries, if desired. Per Serving: 4 g sat. fat, 4 mg chol., 6 g Fat, total, 27 mg sodium, 7 g fiber, 60 g carb., 3 g pro., 300 kcal cal.